Our June meeting was the tenth anniversary of the east central chapter and we were pleased to welcome as our guest demonstrator Graham Whitty, Graham who is a member of the Gorey and district chapter is well known in woodturning circles. (No pun intended) Graham who is a skilled craftsman, showed us just how good he is by turning two pieces from yew logs, the first a candle holder for a ball candle and then a natural edged goblet. 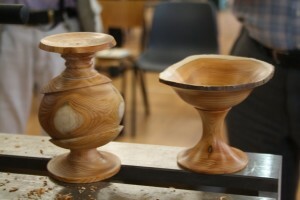 To the candle holder first, a very tricky piece of turning and even trickier to describe but here goes. 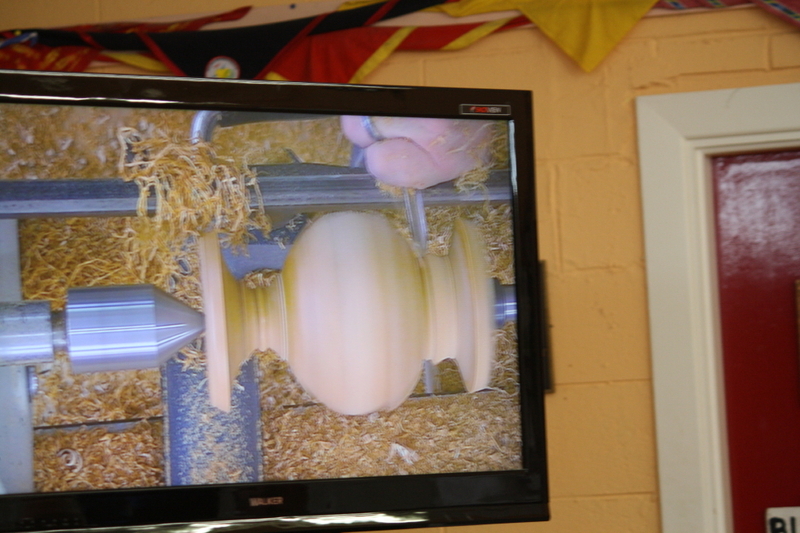 To start, Graham explained that this piece is turned between centres so he mounted the log which was about 120mm in diameter by 300mm in length and proceeded to turn this to a cylinder. 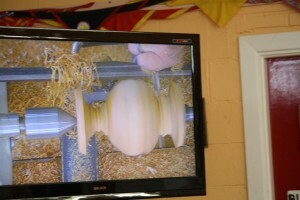 Next, using the tool rest he marked in pencil, a horizontal line along the length, then taking the piece off the lathe he projected this line across both ends through the centre point. Along one end line he marked a new centre point 25mm from the original and repeated this on the other end but this time to the opposite side so when he remounted the piece it was 50mm off the level. 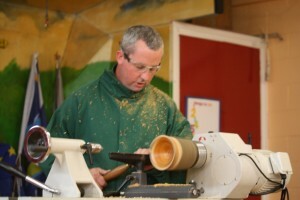 When the lathe was restarted it of course had quite a wobble giving it a butterfly shape but it did show where the centre was and from here Graham was able to start his turning. Using a 9mm spindle gouge he started to form a large bead about 75mm long, this each side of centre and you can imagine the difficulty of this as you are cutting into timber rising each side. 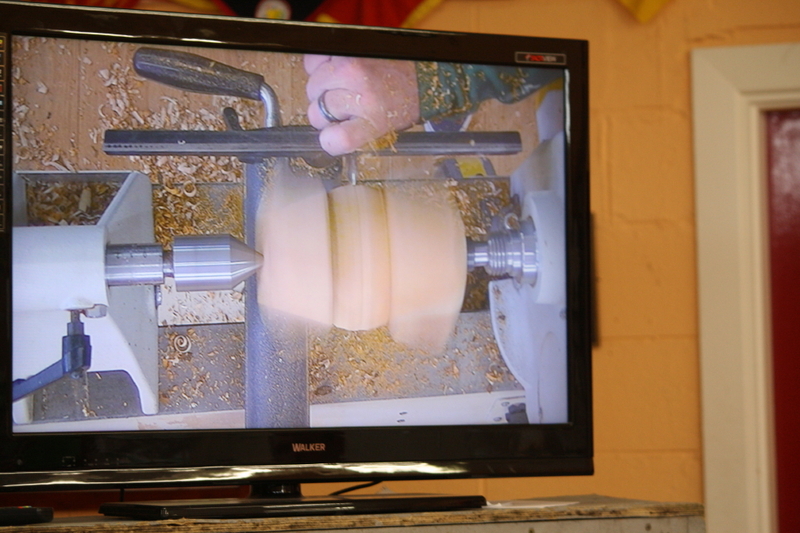 This done he removed the piece from the lathe and reset it back in the original centres. Now with the timber back level you could see where Graham had cut into the wood to form the bead leaving a shoulder at an angle of about 25 degrees each side and from here he formed a cap to the bead which became a sphere, have a look at the photos and you will understand what I’m getting at. 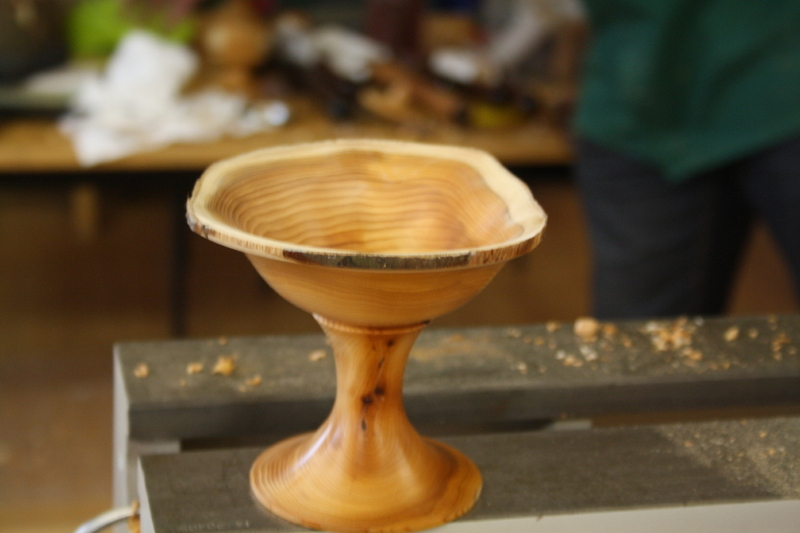 All that remained now was to finish the details to top and bottom, cutting a concave to the top to keep a ball candle in place, lovely job. We had our break here and celebrated with a birthday cake, thanks to Cecil Barron, than back to the wheel for Graham. The second piece was from the same size yew log, this a much simpler turning, (well Graham made it look like that) it was a natural edged goblet and here I will let the photo do the talking, as you can see a beautiful piece. Thank you Graham for a very entertaining afternoon, we look forward to seeing you again. To the competition results and its congratulations again to Jim Hynes in 1st place, to Joe Jordan in 2nd and to Tom Murphy in 3rd. Thank you all for your attendance and let’s see you all entered in next months competition which I believe is a goblet with one captive ring, come on lads and lass we are making it too easy for certain people. 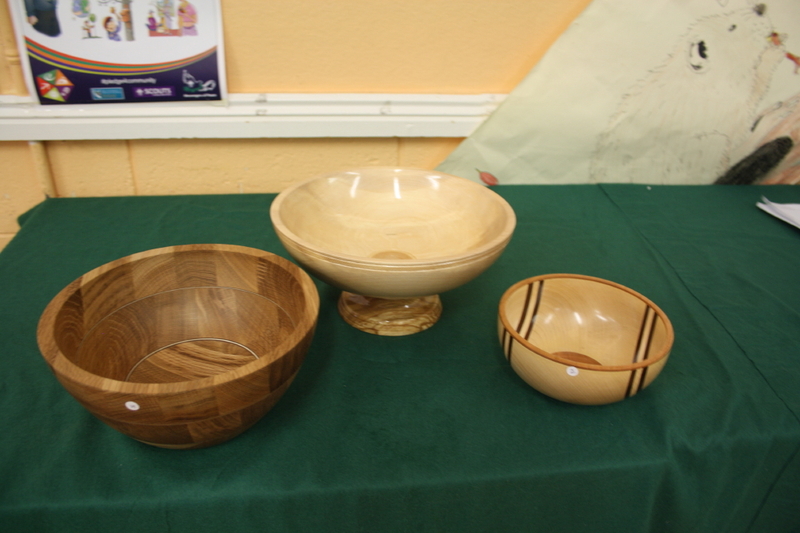 Looking forward to our visit to Seamus Cassidys workshop in Slane next month, see you all there so till then keep well and work safe.